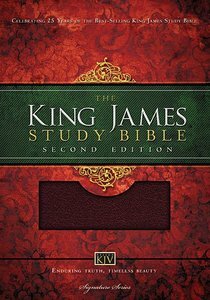 About "KJV Study Bible Burgundy (Second Edition)"
The best-selling study Bible in the King James Version-now updated, with added features. Trusted for 25 years, The King James Study Bible has dependable notes and annotations from scholars you can rely on, led by General Editor Edward Hindson. A clear presentation of conservative Bible doctrine, with the resources you need for knowing God's Word.